When I am fatigued, I am irrationally stressed about the little things and especially the future. Fortunately, I am keenly aware of how I feel when I get tired so I know that my fears are basically make-believe. I know that I will be ok; I learned that while I was busy exhausting myself….it is why I exhaust myself. I did an event last week that really drained me. It was a 50k in the woods on a really hot day. A distance like this would take most runners between about 6-8 hours. It took me 9.5. I am not most runners. I am well slower than most. It would have been much easier to just start the race at a fast walk and finish at a bit slower pace but that is not what I pay for. I’m not really a fan of strategy; I like to run on emotion. I’m addicted to experiences- the good and the bad, the highs and the lows. Ever since I was a kid, I have always had a need to know what was inside. I could never leave well enough alone and good advice has always been seen as a dare. You can tell me it’s hot but I have to feel the burn. For some people, it is about the start and the finish, for folks like me, it is about the in-between. My life isn’t as black and white as a start and a finish- it is about what happens in the middle. I need to find the feeling. I am in search of a high and I never know where it is hiding. A strategic pace doesn’t doesn’t allow me to find it, I need exhaustion. The problem is that I might find my high at mile 6 and lose it by mile 8…but im willing to sacrifice the other 29 miles of misery if it means the intense euphoria that comes with the 2 miles in between. I am not saying it’s logical, I am saying it is what it is. Endurance races are nothing more than reality rides where you get to place yourself in a high pressured bubble in the woods, wait for the race director to press the start button and enjoy a high-intensity, full speed life simulator that knocks you, twists you, twirls you, and flips you around. I have the option of maintaining a pace which keeps me comfortable and safe or going beyond the blanket of security and seeing what lie beyond the curtain. I don’t which way is the right way but I do know which way is more fun. I will never be a fast runner. I don’t work hard enough and I am not willing to put in the time and effort that it takes to excel in the sport, but I plan to always be a contented runner and do what it takes to find pleasure in the sport. This is what I know: whatever situation is placed in front of me, whether it’s on a trail, in my home, or at my workplace, there is only one way to get through it…. 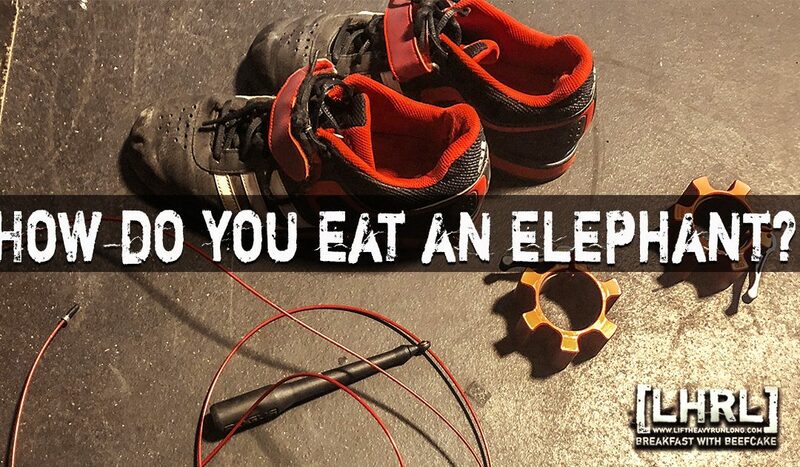 It’s the same way that you eat an elephant.